We develop and manufacture equipment and software for flight simulators. In addition to printed circuit boards and Subsystems, we can also supply complete equipment, such as the CDU and IO boxes for different applications. To control our hardware, we developed a special driver, the EHID. For more information, look here! The MCDU fully developed and manufactured by us represents the highest quality equipment to our flight simulation solutions. With a body made entirely of aluminum, special manufactured injection molded key caps in the day/night design, color TFT, antireflective glass and high quality legends, the device satisfies high demands to durability, reliability and appearance. The electronics based on a modern ARM® processor is manufactured on our own SMD component placement machine. The Ethernet port in combination with our universal EHID driver allows easy integration into various flight simulation software. 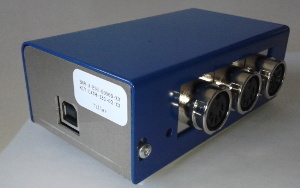 This simple, robust “blue” boxes are used for many tasks in the simulators. Depending on the configuration they convert 2-6 analog and up to 7 digital inputs into our USB protocol. Additional up to 2 PWM outputs can be used for background lighting. The box can be accessed with our universal driver EHID.